The Pittsburgh area is the proud home of passionate organizations operating nature centers. Their mission is to educate people about nature and the environment. Staff or volunteers offer educational programs to the general public, including children and local schools. The centers are typically nestled in a unique ecological area. Here are a few local nature centers to explore and strengthen your connection to the environment. Beechwood Farms Nature Reserve, located on Dorseyville Road in Fox Chapel, is committed to helping everyone in the Pittsburgh region better understand and care for the environment. Managed by the Audubon Society of Western Pennsylvania (ASWP), Beechwood Farms boasts five miles of trails and 134 acres of sanctuary. Its facilities include classrooms, a nature store, a native plants store, a kid-friendly nature play area, teacher resources, and a library. Beechwood Farms has programs for people of all ages. Events range from bird studies to native plant studies to nature classes to hikes. Boyce Park Nature Center, located on Old Frankstown Road in Pittsburgh, sits near the ski slopes of Boyce Parks’ 1,096 acres in Plum Borough. The Nature Center offers displays of geology items, fossils, animal exhibits, observation honey bee hive, a small library area, and a greenhouse. The Center is near several forest and cross country ski trails for those looking for some exercise. There are free nature art programs, horticultural therapy activities, guided tours and interpretive nature walks for all ages. Activities are offered year round along with school, scout club and other “special” groups programming. 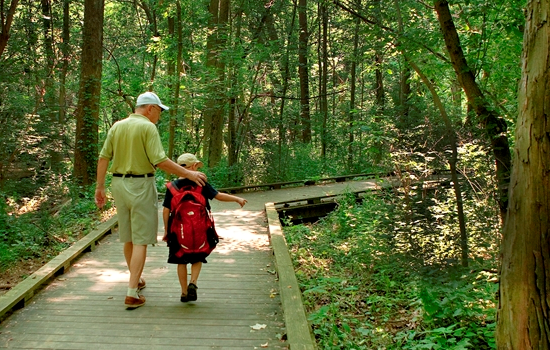 Fern Hollow Nature Center, located on Glen Mitchell Road in Sewickley, offers a self-guided nature walk, a native tree walk, and the first certified Natural Outdoor Classroom in Pennsylvania. The Center has the goal to reconnect children with nature through programming and the use of the grounds. Programs are held on the grounds, in the area parks and often in the region’s vast creek system. Programming includes children’s education, family programs, adult programs, nature walks, community events, summer camps, and local school activities. The Center sees over 6,000 visitors each year. Jennings Environmental Education Center, located 12 miles north of Butler on PA 528, is dedicated to providing environmental education and interpretation to the community. Visitors can learn the skills needed to be good stewards of Pennsylvania’s natural resources. The 20-acre prairie ecosystem has distinctive prairie plants, including a unique flower called the blazing star. It is also home to the endangered massasauga rattlesnake. Programs are available for children, teachers and the general public. They are designed to increase knowledge and awareness of the beauty and importance of natural resources. Programming is offered year-round to schools, civic groups, and the community. Each year over 167,000 visitors are served. Powdermill Nature Reserve, located on Route 381 south of Rector, is the environmental research center of Carnegie Museum of Natural History. For over 50 years, it has been a place for scientists, for students, and for families who are interested in the natural world. The Reserve boasts more than 2,200 acres of woodlands, streams, open fields, ponds, and thickets. Researchers from around the world study at Powdermill. A wide variety of public education programs serve children and adults. Powdermill bird migration research program is home to the one of the longest continually running bird banding stations in the United States.